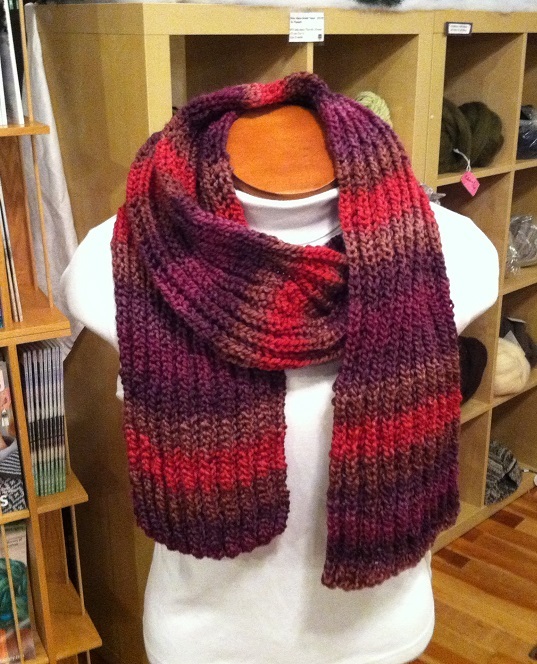 Made with Euro Baby Maypole, a 100% acrylic bulky yarn. I don’t usually knit with acrylic but this was nice to knit with and I like the colors. 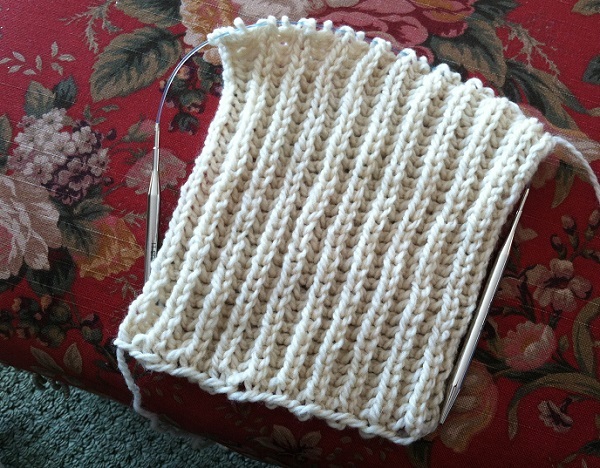 Easy pattern (one row) and with big yarn and big needles it is quick quick quick. YAWN! Off-white in what-looks-like-a-plain-rib-but-isn’t might be ok for me on any regular day. Nice and warm and cozy and goes with everything. But I was making this for a class to introduce the Brioche stitch so I wanted it to have some pizazz and get customers’ attention. Upon closer inspection, this is NOT plain ribbing – it’s a wonderfully lofty and squooshy stitch with the knit stitch really standing out. 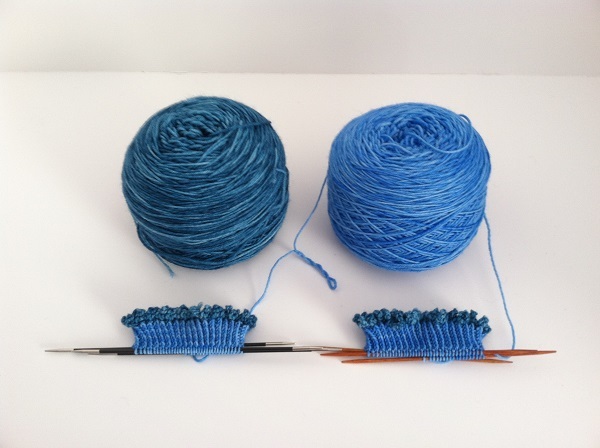 The first half of the class will be to introduce this interesting and easy stitch. The second half will be to practice doing this stich with two colors – really stunning. I have yet to create that swatch but will post it here when it’s done. Easy and a good project to learn cables. The neat thing about this pattern is that it is knit inside out so you can knit more stitches than you purl (which can slow some down). A nice bonus! Made with Cascade Alpaca Lana D’Oro, an alpaca/wool blend. Love this yarn. 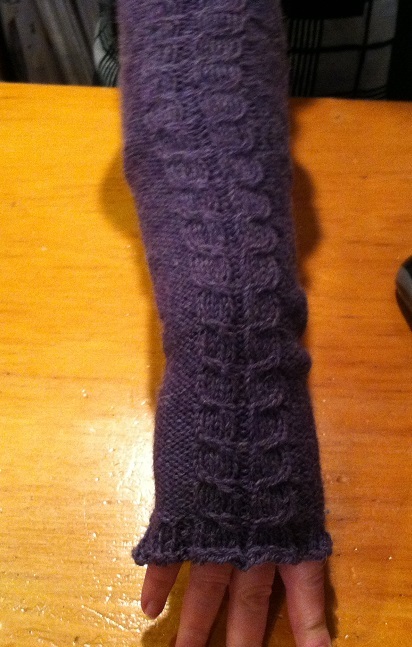 Now I just have to knit the second one…. I have A LOT of stitches on my needles. I haven’t counted but we cast on 200 and have been increasing every other row from there. I hope I don’t run out of yarn. I shouldn’t, since I have 70 more yards than the pattern calls for, but I just have this weird feeling. Interesting picot (read: frilly) cast-on with a contrasting color and a twisted rib pattern in the main color. Cute so far. I really like Kirsten’s designs. Her blog is here: Kirsten Kapur Designs. 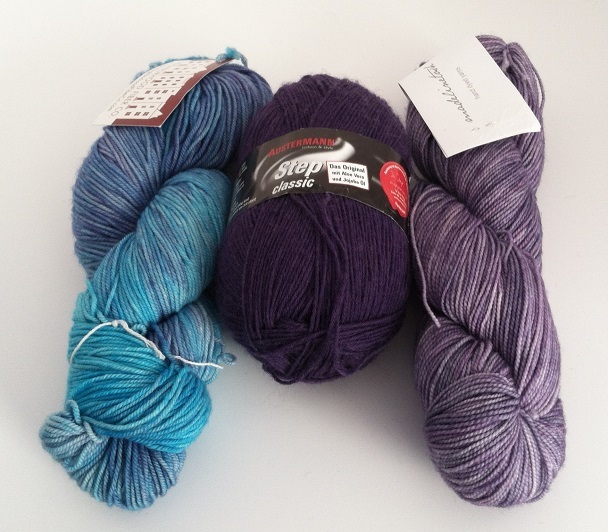 I’m using Periwinkle Sheep Watercolors sock yarn in two colors. The blue is called “Happy Making” and I have not idea what the blue-green is called since I lost the ball band. I love this sock yarn. Finally, I’ll be participating in the Ravellenic Winter Games 2014 on Ravelry. The basic idea is that you choose a project that will be challenging for you to complete during the timeframe of the Winter Olympics. A fun way to challenge yourself and to get a project done quickly! AND something to do while you are watching skiing, skating, luge and curling. 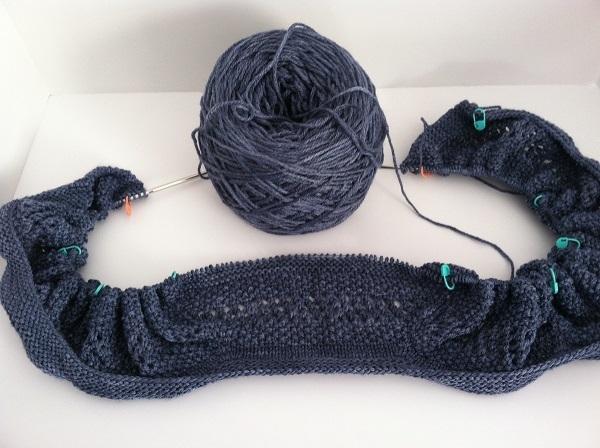 Currently, I’m thinking I will be doing the Prairie Ridge Shawl by Susan B. Anderson. But that could, and likely will, change 80 times before the official cast on time (the beginning of the opening ceremonies of the Olympics on February 7). Whew. The fact that they are starting in a spread out manner is good. However, see me in mid-February when I’m working on ALL of them at the same time. You can bet it will be all documented here on the blog. If I’m not pulling all of my hair out (and I have A LOT of hair). Mind you, I do realize that this is all self-imposed. Knitters are like this, you know. Posted in Uncategorized and tagged easy brioche scarf, jimmy beans wool KAL 2014, knitter's brewing company mystery sock VI KAL, prairie ridge shawl, ravellenic winter games 2014, snow on the laurel, through the loops kal 2014 on January 17, 2014 by lizytish.